René Descartes' illustration of mind/body dualism. Descartes believed inputs were passed on by the sensory organs to the epiphysis in the brain and from there to the immaterial spirit. The mind–body problem is a philosophical problem concerning the relationship between thought and consciousness in the human mind, and the brain as part of the physical body. It is distinct from the question of how mind and body function chemically and physiologically since that question presupposes an interactionist account of mind-body relations. This question arises when mind and body are considered as distinct, based on the premise that the mind and the body are fundamentally different in nature. The problem was addressed by René Descartes in the 17th century, resulting in Cartesian dualism, and by pre-Aristotelian philosophers, in Avicennian philosophy, and in earlier Asian traditions. A variety of approaches have been proposed. Most are either dualist or monist. Dualism maintains a rigid distinction between the realms of mind and matter. Monism maintains that there is only one unifying reality, substance or essence in terms of which everything can be explained. Each of these categories contain numerous variants. The two main forms of dualism are substance dualism, which holds that the mind is formed of a distinct type of substance not governed by the laws of physics, and property dualism, which holds that mental properties involving conscious experience are fundamental properties, alongside the fundamental properties identified by a completed physics. 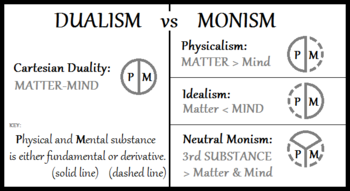 The three main forms of monism are physicalism, which holds that the mind consists of matter organized in a particular way; idealism, which holds that only thought truly exists and matter is merely an illusion; and neutral monism, which holds that both mind and matter are aspects of a distinct essence that is itself identical to neither of them. Psychophysical parallelism is a third possible alternative regarding the relation between mind and body, between interaction (dualism) and one-sided action (monism). Several philosophical perspectives have been developed which reject the mind–body dichotomy. The historical materialism of Karl Marx and subsequent writers, itself a form of physicalism, held that consciousness was engendered by the material contingencies of one's environment. An explicit rejection of the dichotomy is found in French structuralism, and is a position that generally characterized post-war Continental philosophy. The absence of an empirically identifiable meeting point between the non-physical mind (if there is such a thing) and its physical extension (if there is such a thing) has proven problematic to dualism, and many modern philosophers of mind maintain that the mind is not something separate from the body. These approaches have been particularly influential in the sciences, particularly in the fields of sociobiology, computer science, evolutionary psychology, and the neurosciences. An ancient model of the mind known as the Five-Aggregate Model, described in the Buddhist teachings, explains the mind as continuously changing sense impressions and mental phenomena. Considering this model, it is possible to understand that it is the constantly changing sense impressions and mental phenomena (i.e., the mind) that experiences/analyzes all external phenomena in the world as well as all internal phenomena including the body anatomy, the nervous system as well as the organ brain. This conceptualization leads to two levels of analyses: (i) analyses conducted from a third-person perspective on how the brain works, and (ii) analyzing the moment-to-moment manifestation of an individual’s mind-stream (analyses conducted from a first-person perspective). Considering the latter, the manifestation of the mind-stream is described as happening in every person all the time, even in a scientist who analyses various phenomena in the world, including analyzing and hypothesizing about the organ brain. Mind–body interaction has a central place in our pretheoretic conception of agency. Indeed, mental causation often figures explicitly in formulations of the mind–body problem. Some philosophers insist that the very notion of psychological explanation turns on the intelligibility of mental causation. If your mind and its states, such as your beliefs and desires, were causally isolated from your bodily behavior, then what goes on in your mind could not explain what you do. If psychological explanation goes, so do the closely related notions of agency and moral responsibility. Clearly, a good deal rides on a satisfactory solution to the problem of mental causation [and] there is more than one way in which puzzles about the mind's "causal relevance" to behavior (and to the physical world more generally) can arise. Elizabeth is expressing the prevailing mechanistic view as to how causation of bodies works. Causal relations countenanced by contemporary physics can take several forms, not all of which are of the push–pull variety. Contemporary neurophilosopher Georg Northoff suggests that mental causation is compatible with classical formal and final causality. Biologist, theoretical neuroscientist and philosopher, Walter J. Freeman, suggests that explaining mind–body interaction in terms of "circular causation" is more relevant than linear causation. In neuroscience, much has been learned about correlations between brain activity and subjective, conscious experiences. Many suggest that neuroscience will ultimately explain consciousness: "...consciousness is a biological process that will eventually be explained in terms of molecular signaling pathways used by interacting populations of nerve cells..." However, this view has been criticized because consciousness has yet to be shown to be a process, and the "hard problem" of relating consciousness directly to brain activity remains elusive. Cognitive science today gets increasingly interested in the embodiment of human perception, thinking, and action. Abstract information processing models are no longer accepted as satisfactory accounts of the human mind. Interest has shifted to interactions between the material human body and its surroundings and to the way in which such interactions shape the mind. Proponents of this approach have expressed the hope that it will ultimately dissolve the Cartesian divide between the immaterial mind and the material existence of human beings (Damasio, 1994; Gallagher, 2005). A topic that seems particularly promising for providing a bridge across the mind–body cleavage is the study of bodily actions, which are neither reflexive reactions to external stimuli nor indications of mental states, which have only arbitrary relationships to the motor features of the action (e.g., pressing a button for making a choice response). The shape, timing, and effects of such actions are inseparable from their meaning. One might say that they are loaded with mental content, which cannot be appreciated other than by studying their material features. Imitation, communicative gesturing, and tool use are examples of these kinds of actions. The neuronal correlates of consciousness constitute the smallest set of neural events and structures sufficient for a given conscious percept or explicit memory. This case involves synchronized action potentials in neocortical pyramidal neurons. The neural correlates of consciousness "are the smallest set of brain mechanisms and events sufficient for some specific conscious feeling, as elemental as the color red or as complex as the sensual, mysterious, and primeval sensation evoked when looking at [a] jungle scene..." Neuroscientists use empirical approaches to discover neural correlates of subjective phenomena. A science of consciousness must explain the exact relationship between subjective conscious mental states and brain states formed by electrochemical interactions in the body, the so-called hard problem of consciousness.Neurobiology studies the connection scientifically, as do neuropsychology and neuropsychiatry. Neurophilosophy is the interdisciplinary study of neuroscience and philosophy of mind. In this pursuit, neurophilosophers, such as Patricia Churchland, Paul Churchland and Daniel Dennett, have focused primarily on the body rather than the mind. In this context, neuronal correlates may be viewed as causing consciousness, where consciousness can be thought of as an undefined property that depends upon this complex, adaptive, and highly interconnected biological system. However, it's unknown if discovering and characterizing neural correlates may eventually provide a theory of consciousness that can explain the first-person experience of these "systems", and determine whether other systems of equal complexity lack such features. The massive parallelism of neural networks allows redundant populations of neurons to mediate the same or similar percepts. Nonetheless, it is assumed that every subjective state will have associated neural correlates, which can be manipulated to artificially inhibit or induce the subject's experience of that conscious state. The growing ability of neuroscientists to manipulate neurons using methods from molecular biology in combination with optical tools was achieved by the development of behavioral and organic models that are amenable to large-scale genomic analysis and manipulation. Non-human analysis such as this, in combination with imaging of the human brain, have contributed to a robust and increasingly predictive theoretical framework. There are two common but distinct dimensions of the term consciousness, one involving arousal and states of consciousness and the other involving content of consciousness and conscious states. To be conscious of something, the brain must be in a relatively high state of arousal (sometimes called vigilance), whether awake or in REM sleep. Brain arousal level fluctuates in a circadian rhythm but these natural cycles may be influenced by lack of sleep, alcohol and other drugs, physical exertion, etc. Arousal can be measured behaviorally by the signal amplitude required to trigger a given reaction (for example, the sound level that causes a subject to turn and look toward the source). High arousal states involve conscious states that feature specific perceptual content, planning and recollection or even fantasy. Clinicians use scoring systems such as the Glasgow Coma Scale to assess the level of arousal in patients with impaired states of consciousness such as the comatose state, the persistent vegetative state, and the minimally conscious state. Here, "state" refers to different amounts of externalized, physical consciousness: ranging from a total absence in coma, persistent vegetative state and general anesthesia, to a fluctuating, minimally conscious state, such as sleep walking and epileptic seizure. Many nuclei with distinct chemical signatures in the thalamus, midbrain and pons must function for a subject to be in a sufficient state of brain arousal to experience anything at all. These nuclei therefore belong to the enabling factors for consciousness. Conversely it is likely that the specific content of any particular conscious sensation is mediated by particular neurons in the cortex and their associated satellite structures, including the amygdala, thalamus, claustrum and the basal ganglia. The following is a very brief account of some contributions to the mind–body problem. The Buddha (480–400 B.C.E), founder of Buddhism, described the mind and the body as depending on each other in a way that two sheaves of reeds were to stand leaning against one another and taught that the world consists of mind and matter which work together, interdependently. Buddhist teachings describe the mind as manifesting from moment to moment, one thought moment at a time as a fast flowing stream. The components that make up the mind are known as the five aggregates (i.e., material form, feelings, perception, volition, and sensory consciousness), which arise and pass away continuously. The arising and passing of these aggregates in the present moment is described as being influenced by five causal laws: biological laws, psychological laws, physical laws, volitional laws, and universal laws. The Buddhist practice of mindfulness involves attending to this constantly changing mind-stream. Ultimately, the Buddha's philosophy is that both mind and forms are conditionally arising qualities of an ever-changing universe in which, when nirvāna is attained, all phenomenal experience ceases to exist. According to the anattā doctrine of the Buddha, the conceptual self is a mere mental construct of an individual entity and is basically an impermanent illusion, sustained by form, sensation, perception, thought and consciousness. The Buddha argued that mentally clinging to any views will result in delusion and stress, since, according to the Buddha, a real self (conceptual self, being the basis of standpoints and views) cannot be found when the mind has clarity. Plato (429–347 B.C.E.) believed that the material world is a shadow of a higher reality that consists of concepts he called Forms. According to Plato, objects in our everyday world "participate in" these Forms, which confer identity and meaning to material objects. For example, a circle drawn in the sand would be a circle only because it participates in the concept of an ideal circle that exists somewhere in the world of Forms. He argued that, as the body is from the material world, the soul is from the world of Forms and is thus immortal. He believed the soul was temporarily united with the body and would only be separated at death, when it would return to the world of Forms. Since the soul does not exist in time and space, as the body does, it can access universal truths. For Plato, ideas (or Forms) are the true reality, and are experienced by the soul. The body is for Plato empty in that it can not access the abstract reality of the world; it can only experience shadows. This is determined by Plato's essentially rationalistic epistemology. It is not necessary to ask whether soul and body are one, just as it is not necessary to ask whether the wax and its shape are one, nor generally whether the matter of each thing and that of which it is the matter are one. For even if one and being are spoken of in several ways, what is properly so spoken of is the actuality. In the end, Aristotle saw the relation between soul and body as uncomplicated, in the same way that it is uncomplicated that a cubical shape is a property of a toy building block. The soul is a property exhibited by the body, one among many. Moreover, Aristotle proposed that when the body perishes, so does the soul, just as the shape of a building block disappears with destruction of the block. In religious philosophy of Eastern monotheism, dualism denotes a binary opposition of an idea that contains two essential parts. The first formal concept of a "mind-body" split may be found in the "divinity - secularity" dualism of the ancient Persian religion of Zoroastrianism around the mid-fifth century BC. Gnosticism is a modern name for a variety of ancient dualistic ideas inspired by Judaism popular in the first and second century AD. These ideas later seem to have been incorporated into Galen's "tripartite soul" that led into both the Christian sentiments  expressed in the later Augustinian theodicy and Avicenna’s Platonism in Islamic Philosophy. Like Aristotle, St. Thomas Aquinas (1225–1274) believed that the mind and the body are one, like the seal and the wax are one, and it is therefore pointless to ask whether they are one. However, (referring to "mind" as "the soul") he asserted that the soul persists after the death of the body in spite of their unity, calling the soul "this particular thing". Since his view was primarily theological rather than philosophical, it is impossible to fit it neatly within either the category of physicalist or dualist. My view is that this gland is the principal seat of the soul, and the place in which all our thoughts are formed. 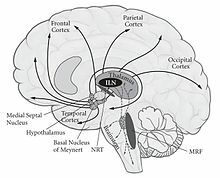 [The] mechanism of our body is so constructed that simply by this gland's being moved in any way by the soul or by any other cause, it drives the surrounding spirits towards the pores of the brain, which direct them through the nerves to the muscles; and in this way the gland makes the spirits move the limbs. His posited relation between mind and body is called Cartesian dualism or substance dualism. He held that mind was distinct from matter, but could influence matter. How such an interaction could be exerted remains a contentious issue. For Kant (1724–1804) beyond mind and matter there exists a world of a priori forms, which are seen as necessary preconditions for understanding. Some of these forms, space and time being examples, today seem to be pre-programmed in the brain. ...whatever it is that impinges on us from the mind-independent world does not come located in a spatial or a temporal matrix,...The mind has two pure forms of intuition built into it to allow it to... organize this 'manifold of raw intuition'. Kant views the mind–body interaction as taking place through forces that may be of different kinds for mind and body. For Huxley (1825–1895) the conscious mind was a by-product of the brain that has no influence upon the brain, a so-called epiphenomenon. On the epiphenomenalist view, mental events play no causal role. Huxley, who held the view, compared mental events to a steam whistle that contributes nothing to the work of a locomotive. A. N. Whitehead advocated a sophisticated form of panpsychism that has been called by David Ray Griffin panexperientialism. For Popper (1902–1994) there are three aspects of the mind–body problem: the worlds of matter, mind, and of the creations of the mind, such as mathematics. In his view, the third-world creations of the mind could be interpreted by the second-world mind and used to affect the first-world of matter. An example might be radio, an example of the interpretation of the third-world (Maxwell's electromagnetic theory) by the second-world mind to suggest modifications of the external first world. The body–mind problem is the question of whether and how our thought processes in World 2 are bound up with brain events in World 1. ...I would argue that the first and oldest of these attempted solutions is the only one that deserves to be taken seriously [namely]: World 2 and World 1 interact, so that when someone reads a book or listens to a lecture, brain events occur that act upon the World 2 of the reader's or listener's thoughts; and conversely, when a mathematician follows a proof, his World 2 acts upon his brain and thus upon World 1. This, then, is the thesis of body–mind interaction. For Searle (b. 1932) the mind–body problem is a false dichotomy; that is, mind is a perfectly ordinary aspect of the brain. ^ a b Skirry, Justin. "Rene Descartes: The Mind-Body Distinction". Internet Encyclopedia of Philosophy. ISSN 2161-0002. Archived from the original on 19 November 2016. Retrieved 20 December 2016. The real distinction of mind and body based on their completely diverse natures is the root of the famous mind-body problem: how can these two substances with completely different natures causally interact so as to give rise to a human being capable of having voluntary bodily motions and sensations? ^ Robert M. Young (1996). "The mind–body problem". In RC Olby; GN Cantor; JR Christie; MJS Hodges (eds.). Companion to the History of Modern Science (Paperback reprint of Routledge 1990 ed.). Taylor and Francis. pp. 702–11. ISBN 978-0415145787. Archived from the original on 2007-06-14. ^ Henrik Lagerlund (2010). "Introduction". In Henrik Lagerlund (ed.). Forming the Mind: Essays on the Internal Senses and the Mind/Body Problem from Avicenna to the Medical Enlightenment (Paperback reprint of 2007 ed.). Springer Science+Business Media. p. 3. ISBN 978-9048175307. Chisholm, Hugh, ed. (1911). "Parallelism, Psychophysical" . Encyclopædia Britannica. 20 (11th ed.). Cambridge University Press. p. 762. ^ K. Marx, A Contribution to the Critique of Political Economy, Progress Publishers, Moscow, 1977, with some notes by R. Rojas. ^ Bryan S. Turner (2008). The Body and Society: Explorations in Social Theory (3rd ed.). Sage Publications. p. 78. ISBN 978-1412929875. ...a rejection of any dualism between mind and body, and a consequent insistence on the argument that the body is never simply a physical object but always an embodiment of consciousness. ^ Kim, Jaegwan (1995). "Emergent properties". In Honderich, Ted (ed.). Problems in the Philosophy of Mind. Oxford Companion to Philosophy. Oxford: Oxford University Press. p. 240. ^ Pinel, J. (2009). Psychobiology (7th ed.). Pearson/Allyn and Bacon. ISBN 978-0205548927. ^ LeDoux, J. (2002). The Synaptic Self: How Our Brains Become Who We Are. Viking Penguin. ISBN 978-88-7078-795-5. ^ Russell, S. & Norvig, P. (2010). Artificial Intelligence: A Modern Approach (3rd ed.). Prentice Hall. ISBN 978-0136042594. ^ Dawkins, R. (2006). The Selfish Gene (3rd ed.). Oxford University Press. ISBN 978-0199291144. ^ a b c d Karunamuni N.D. (May 2015). "The Five-Aggregate Model of the Mind". SAGE Open. 5 (2): 215824401558386. doi:10.1177/2158244015583860. ^ Robb, David; Heil, John (2009). "Mental Causation". In Edward N. Zalta (ed.). The Stanford Encyclopedia of Philosophy (Summer 2009 ed.). ^ Georg Northoff (2004). Philosophy of the Brain: The Brain Problem (Volume 52 of Advances in Consciousness Research ed.). John Benjamins Publishing. pp. 137–139. ISBN 978-1588114174. The restriction of causality to 'efficient causality' lead to the neglect of 'goal-orientation' since it was no longer necessary within [that] framework. Not considering 'goal-orientation' resulted in the neglect of 'embedment' and the consequential presupposition of 'isolation' with separation between brain, body, and environment. Neglecting 'embedment' lead to the equation of perception/action with sensory impression/movement which could be well accounted for by 'efficient causality'. Accordingly, since dominated by 'efficient causality', qualia and intentionality, as related to perception/action rather than to sensory impression/movement, were excluded from science and consequently regarded [as] purely philosophical problems. Analogous to 'final causes', 'formal causes' were eliminated as well. 'Efficient causality' is not compatible with 'embedded coding' [which] is necessarily tied with 'formal causality' and 'final causality'... Finally, the possibility of mental causation remains incompatible with 'efficient causality'. It can, however, be properly described by 'formal and final causality'. ^ Walter J Freeman (2009). "Consciousness, intentionality and causality". In Susan Pockett; WP Banks; Shaun Gallagher (eds.). Does Consciousness Cause Behavior?. MIT Press. pp. 4–5, 88–90. ISBN 978-0262512572. Walter Freeman, with his usual originality, suggest that we may be looking at the whole thing in completely the wrong way when we ask whether consciousness causes or is caused by neural activity. He suggests that circular causation is a more relevant concept in this regard than linear causation. Consciousness and neural activity are certainly interdependent, but it is impossible in principle to say that either causes the other. Thus the whole concept of consciousness as agent is simply a misreading of the true situation. Through my readings in physics and philosophy, I learned the concept of circular causality, which invokes hierarchical interactions of immense numbers of semiautonomous elements such as neurons, which form nonlinear systems. These exchanges lead to the formation of macroscopic population dynamics that shapes the pattern of activity of the contributing individuals. Circular causality departs so strongly from the classical tenets of necessity, invariance, and precise temporal order that the only reason to call it that is to satisfy the human habitual need for causes. The most subtle shift is the disappearance of agency, which is equivalent to loss of Aristotle's efficient cause. The very strong appeal of agency to explain events may come from the subjective experience of cause and effect that develops early in human life, before the acquisition of language .the question I raise here is whether brains share this property with other material objects in the world. The answer I propose is that assignment of cause and effect to one's self and to others having self-awareness is entirely appropriate, but that investing insensate objects with causation is comparable to investing them with teleology and soul. The further question is: Does it matter whether or not causality is assigned to objects? The answer is "Very much." Several examples are given of scientific errors attributed to thinking in terms of linear causality. The most important, with wide ramifications, is the assumption of universal determinacy, by which the causes of human behavior are limited to environmental and genetic factors, and the causal power of self-determination is excluded from scientific consideration. ^ Eric R. Kandel (2007). In Search of Memory: The Emergence of a New Science of Mind. WW Norton. p. 9. ISBN 978-0393329377. ^ Oswald Hanfling (2002). Wittgenstein and the Human Form of Life. Psychology Press. pp. 108–109. ISBN 978-0415256452. ^ A term attributed to David Chalmers by Eugene O Mills (1999). "Giving up on the hard problem of consciousness". In Jonathan Shear (ed.). Explaining Consciousness: The Hard Problem. MIT Press. p. 109. ISBN 978-0262692212. ^ Goldenberg, Georg (2008). "Chapter 7, How the Mind Moves the Body: Lessons From Apraxia". In Morsella, E.; Bargh, J.A. ; Gollwitzer, P.M. (eds.). Oxford Handbook of Human Action. Social Cognition and Social Neuroscience. Oxford University Press, USA. p. 136. ISBN 9780195309980. LCCN 2008004997. ^ Christof Koch (2004). "Figure 1.1: Neuronal correlates of consciousness". The Quest for Consciousness: A Neurobiological Approach. Englewood, Colorado: Roberts & Company Publishers. p. 16. ISBN 978-0974707709. ^ Christof Koch (2004). "Chapter 5: What are the neuronal correlates of consciousness?". The Quest for Consciousness: A Neurobiological Approach. Englewood, Colorado: Roberts & Company Publishers. pp. xvi, 97, 104. ISBN 978-0974707709. ^ Kandel, Eric R. (2007). In search of memory: The emergence of a new science of mind. W. W. Norton & Company. p. 382. ISBN 978-0393329377. ^ Churchland, Patricia Smith (2002). Brain-Wise: Studies in Neurophilosophy. Bradford Books. MIT Press. back cover. ISBN 9780262532006. LCCN 2002066024. Brain-Wise is the sequel to Patricia Smith Churchland's Neurophilosophy, the book that launched a sub-field. In a clear, conversational manner, this text examines old questions about the nature of the mind within the new framework of the brain sciences. What, it asks, is the neurobiological basis of consciousness, the self, and free choice? ^ Churchland, Patricia Smith (1989). Neurophilosophy: Toward a Unified Science of the Mind–Brain. Computational Models of Cognition and Perception. MIT Press. back cover. ISBN 9780262530859. LCCN 85023706. Neurophilosophy is a rich interdisciplinary study of the prospects for a unified cognitive neurobiology. Contemporary research in the empirical neurosciences, and recent research in the philosophy of mind and the philosophy of science, are used to illuminate fundamental questions concerning the relation between abstract cognitive theory and substantive neuroscience. ^ Churchland, Paul (2007). Neurophilosophy at Work. Cambridge University Press. pp. viii–ix. ISBN 9780521864725. LCCN 2006014487. In what follows, we shall explore contemporary issues in the nature of consciousness itself, the fortunes of nonreductive materialism (specifically, functionalism) in the philosophy of mind, the neuronal basis of our moral knowledge, the future of our moral consciousness, the roles of science and religion in our public schools, the proper cognitive kinematics for the epistemology of the twenty-first century, the basic nature of intelligence, the proper semantic theory for the representational states of terrestrial brains generally, the fortunes of scientific realism, recent arguments against the identity theory of the mind–brain relation, the fundamental differences between digital computers and biological brains, the neuronal basis of our subjective color qualia, the existence of novel – indeed, 'impossible' – color qualia, and the resurrection of objective colors from mere 'secondary' properties to real and important features of physical surfaces. What unites these scattered concerns is, once more, that they are all addressed from the standpoint of the emerging discipline of cognitive neurobiology. The exercise, as a whole, is thus a test of that discipline's systematic relevance to a broad spectrum of traditional philosophical issues. ^ Dennett, Daniel C. (1986). Content and Consciousness. International Library of Philosophy. Taylor \& Francis. jacket. ISBN 9780415104319. LCCN 72436737. This book revises the traditional view of consciousness by claiming that Cartesianism and Descartes' dualism of mind and body should be replaced with theories from the realms of neuroscience, psychology and artificial intelligence. What people think of as the stream of consciousness is not a single, unified sequence, the author argues, but 'multiple drafts' of reality composed by a computer-like 'virtual machine'. Dennett considers how consciousness could have evolved in human beings and confronts the classic mysteries of consciousness: the nature of introspection, the self or ego and its relation to thoughts and sensations, and the level of consciousness of non-human creatures. ^ Dennett, Daniel C. (1997). Kinds of Minds: Toward an Understanding of Consciousness. Science Masters Series. Basic Books. p. back cover. ISBN 9780465073511. LCCN 96164655. Combining ideas from philosophy, artificial intelligence, and neurobiology, Daniel Dennett leads the reader on a fascinating journey of inquiry, exploring such intriguing possibilities as: Can any of us really know what is going on in someone else's mind? What distinguishes the human mind from the minds of animals, especially those capable of complex behavior? If such animals, for instance, were magically given the power of language, would their communities evolve an intelligence as subtly discriminating as ours? Will robots, once they have been endowed with sensory systems like those that provide us with experience, ever exhibit the particular traits long thought to distinguish the human mind, including the ability to think about thinking? Dennett addresses these questions from an evolutionary perspective. Beginning with the macromolecules of DNA and RNA, the author shows how, step-by-step, animal life moved from the simple ability to respond to frequently recurring environmental conditions to much more powerful ways of beating the odds, ways of using patterns of past experience to predict the future in never-before-encountered situations. ^ Squire, Larry R. (2008). Fundamental neuroscience (3rd ed.). Academic Press. p. 1223. ISBN 978-0-12-374019-9. ^ Adamantidis A.R. ; Zhang F.; Aravanis A.M.; Deisseroth K.; de Lecea L. (2007). "Neural substrates of awakening probed with optogenetic control of hypocretin neurons". Nature. 450 (7168): 420–4. doi:10.1038/nature06310. PMID 17943086. ^ Christof Koch (2004). "Figure 5.1 The Cholinergic Enabling System". The Quest for Consciousness: A Neurobiological Approach. Englewood, Colorado: Roberts & Company Publishers. p. 91. ISBN 978-0974707709. Also see Chapter 5, available on line. ^ Zeman, A. (2001). "Consciousness". Brain. 124 (7): 1263–1289. doi:10.1093/brain/124.7.1263. PMID 11408323. Archived from the original on 2011-04-07. Aristotle now lets this aspect of nous and hand define a new term which he does not use anywhere else, so far as I know. The hand is “a tool of tools.” The nous is a “form of forms.” The hand and the soul are unique in this respect. Let us see further what this means. Aristotle seems to say that the nous is a form, but on closer inspection we find that it is not, or at least not the usual kind. Nous is a maker of forms. A “form of forms” is like a tool of tools, like a living body’s organ that makes tools. Nous is certainly not itself the sort of form that it makes. The hand is not a made tool (it would have to be made by yet another hand). In Greek “tool” and “organ” are the same word. So we see: ”In the phrase “tool of tools” the first use of the word stands for a living organ, the second for an artificially made tool. In II-4 he says “all natural bodies are tools (organs) of the soul’s,” (both as food and as material from which to make tools). In English we would say that the hand is the organ of tools. 431b230–432a14. To sum up: the soul is in a manner the universe of things, which is made up of things sensible and things intelligible: and knowledge is in a manner identical with its object, the intelligible; sense with its object, the sensible. This statement calls for further explanation. Sense and knowledge, whether potential or actual, are distributed over things potential or actual, as the case may be. In the soul, again, the sensitive faculty and the cognitive faculty are potentially their respective objects. These objects must therefore exist in the soul, not indeed as concrete wholes, form and matter combined, which is impossible: it must be the forms of things which exist in the soul. Thus within the soul intellect is the form of forms, i.e. of intelligible forms, and sense the form of sensibles, precisely as in the body the hand is the instrument of instruments, i.e. the instrument by which other instruments are acquired. ^ Shields, Christopher. Edward N. Zalta (ed.). "Aristotle's Psychology". The Stanford Encyclopedia of Philosophy (Spring 2011 Edition). ^ McInerny, Ralph; O'Callaghan, John (Summer 2018). "Saint Thomas Aquinas". The Stanford Encyclopedia of Philosophy. Retrieved 7 November 2018. ^ Eric Watkins (2004). "Causality in context". Kant and the Metaphysics of Causality. Cambridge University Press. p. 108. ISBN 978-0521543613. ^ Robinson, William (January 27, 2011). Edward N. Zalta (ed.). "Epiphenomenalism". The Stanford Encyclopedia of Philosophy (Summer 2012 Edition). ^ See, e.g., Ronny Desmet and Michel Weber (edited by), Whitehead. The Algebra of Metaphysics. Applied Process Metaphysics Summer Institute Memorandum Archived 2017-07-27 at the Wayback Machine, Louvain-la-Neuve, Éditions Chromatika, 2010 (ISBN 978-2-930517-08-7). ^ Karl Raimund Popper (1999). "Notes of a realist on the body–mind problem". All Life is Problem Solving (A lecture given in Mannheim, 8 May 1972 ed.). Psychology Press. pp. 29 ff. ISBN 978-0415174862. The body–mind relationship...includes the problem of man's position in the physical world...'World 1'. The world of conscious human processes I shall call 'World 2', and the world of the objective creations of the human mind I shall call 'World 3'. ^ Joshua Rust (2009). John Searle. Continuum International Publishing Group. pp. 27–28. ISBN 978-0826497529. Feigl, Herbert (1958). "The 'Mental' and the 'Physical'". In Feigl, Herbert; Scriven, Michael; Maxwell, Grover (eds.). Concepts, Theories, and the Mind–Body Problem. Minnesota Studies in the Philosophy of Science. 2. Minneapolis: University of Minnesota Press. pp. 370–457. Gendlin, E. T. (2012a). "Line by Line translation on Aristotle's De Anima, Books I and II" (PDF). Gendlin, E. T. (2012b). "Line by Line translation on Aristotle's De Anima, Book III" (PDF). Hicks, R. D. (1907). Aristotle, De Anima. Cambridge University Press. Kim, J., "Mind–Body Problem", Oxford Companion to Philosophy. Ted Honderich (ed.). Oxford:Oxford University Press. 1995. Jaegwon Kim (2010). Essays in the Metaphysics of Mind. Oxford University Press. ISBN 978-0191625060. Wikimedia Commons has media related to Mind–body problem. Robert M. Young (1996). "The mind–body problem". In RC Olby; GN Cantor; JR Christie; MJS Hodges (eds.). Companion to the History of Modern Science (Paperback reprint of Routledge 1990 ed.). Taylor and Francis. pp. 702–11. ISBN 978-0415145787.